In order for Kitchen Display to function, you would require another iPad with MobiPOS Kitchen Display installed. 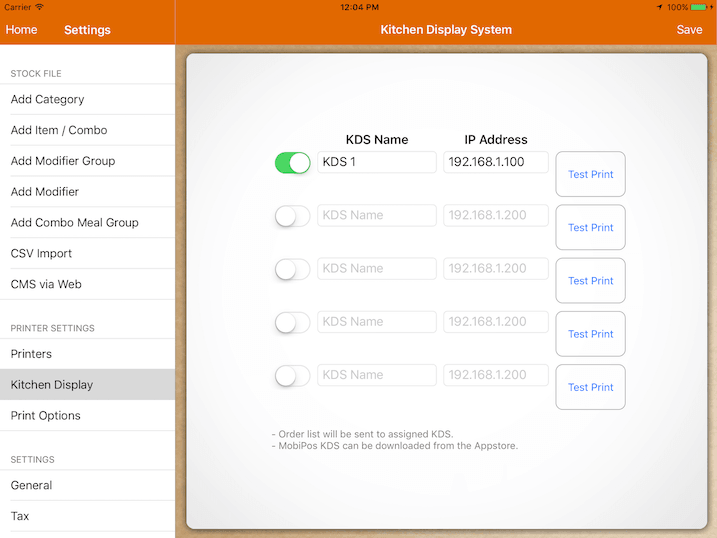 Under Settings -> Kitchen Display, key in the IP address of the KDS, the IP address can be found under the kitchen display app's Settings. 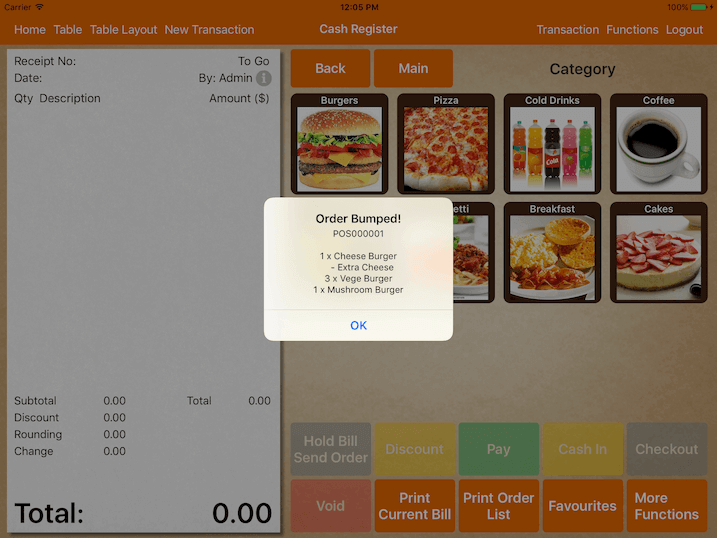 By default, MobiPOS does not send order to the kitchen display even after setting it up in the setting shown above. Kitchen display works like a physical printer and you have to configure it under category/item assigned kitchen printer setting. Under Settings -> Category -> select a category -> Click Assigned Kitchen Printer -> Select the KDS (Ticked) -> Save. Now, whenever you hold your bill, your KDS should receive the order. Our kitchen display can be linked. Which means bumping an order in one of the KDS will notify another KDS. For example if you have 2 stations running 2 KDS, configure your POS to send the order to both of the KDS. When the chef in station 1 sees it, he taps on the order to mark as done, KDS in station 2 will be notified that order is marked as done as well. Make sure to sync your KDS with POS under kitchen display settings to allow this to work. 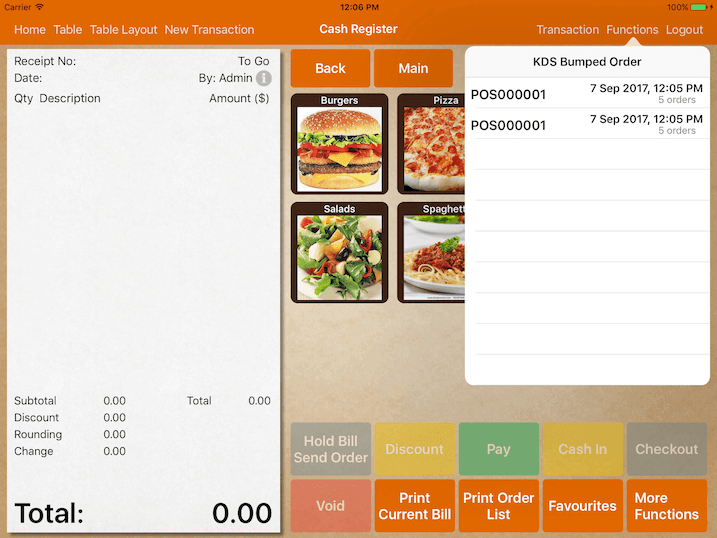 KDS can be configured to notify your main POS system or an expedite screen when a bill is bumped. You can use a kitchen display as an expedite screen. Key in your POS/Expedite screen IP address under settings. A sample when POS receives a completed bump. You could recall bumped order by going under Functions -> KDS Bumped Order. If you use kitchen display as an expedite screen, when bill is bumped, it will transfer the entire bill from KDS to the expedite screen.